One of the things which always fascinates me about people who own old cars is their broad range of interests. Thinking just of some of the people who I know within the Ringmer group, there are model railway enthusiasts (there’s even one couple who live in a railway carriage), there are steam and traction engine enthusiasts and for my own part I have a penchant for grand-father clocks and early pianos as well as anything else mechanical. 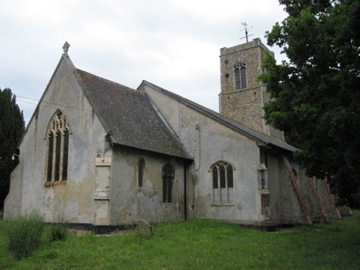 We all have in common our love or fascination with old cars and most old car meetings are usually held at a pub and in most proper English villages, pubs are usually close to a church; so it’s not surprising that a lot of old car enthusiasts also appreciate old churches. Perhaps it’s the materials from which they’re made, maybe it’s the design and the engineering - anyway I’m going to write about a particularly interesting church which Toni and I saw in Suffolk last month. One of my favourite travel writers is Christopher Somerville whose articles are often featured in the Times, the Telegraph or the Financial Times.. http://www.christophersomerville.co.uk but in this instance I had bought a book which he wrote called “Britain and Ireland’s Best Wild Places”.Before we went to Suffolk on an Alvis rally I thumbed through the book and came across the story of Wenhaston Doom Church - with a name like that what man in his second child-hood could resist? Doom paintings are also known as ‘Last Judgement’ paintings and were invariably painted on the walls of Medieval churches. The paintings were usually above the Chancel Arch as this represented the separation of the priest’s domain in the chancel from that of the congregation in the nave. But this symbolism was also meant to refer to the divide between life on Earth and the souls in Purgatory. “Doom” paintings usually include key figures or set-pieces.